These statements caught my ear because they said something about my family that I’d never noticed before. They are future-thinking, goal-oriented, action-bound statements. You don’t often hear these from a group of people who have shared a long past together. We like to revisit the past at family gatherings. We like to discuss the present, too, catching up on what’s been happening. But families who share their dreams for the future are special. Their talks are woven from threads of hope, trust, and encouragement. They have something to look forward to. They are not weighed down by something to keep hidden. Oh, they have their fights and trigger topics, but they enjoy divulging their plans because past experience has shown them they will be supported and loved regardless. Sometimes families get in a communication rut. They forget why they are together and how much being together means. Church families can be the same way. Families can be inhibiting or they can wrap you up in the feeling that you are truly interesting, wanted, and needed. It’s amazing how quickly group personalities can change with the addition or subtraction of people. Just one person can stir up a habit or thought that will put the whole group onto another track. Thinking about family personality had me considering the books I read. Do you know how few books I’ve read lately that even have a central family in the story? Kids books sometimes do, but the middle school and young adult tend toward the dysfunctional family dynamic. The adult books hardly attempt to draw from family unity at all. So, what opportunities do we readers have to see the family in action? I can think of five books that exhibit obvious family personality. 2. 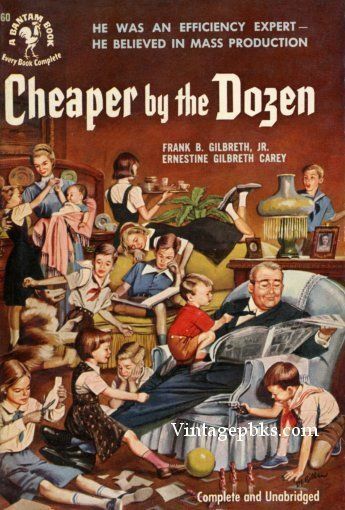 Cheaper by the Dozen by Gilbreth and Carey. 3. Another book I would love to get my hands on is My Philadelphia Father by Biddle/Crichton. At least, I think I’d like it. 4. Wilder’s Little House on the Prairie series. Everyone of these are based on real families. I haven’t come up with a fictional family yet. What about you? Can you think of a book that really exudes family personality (fictional or truth-based)?